While analyzing the top rushing attacks in the NFL, it’s clear many have their own unique style. The Los Angeles Rams want to run you sideline to sideline. The Pittsburgh Steelers want to punch you in the mouth. The Philadelphia Eagles, on the other hand, want to keep you off balance. Philadelphia operates one of the most diverse rushing attacks in the league, executing an attack that’s willing to throw any concept at you at least once. One they keep coming back to, however, is the ultimate ‘off balance’ run concept: the trap. 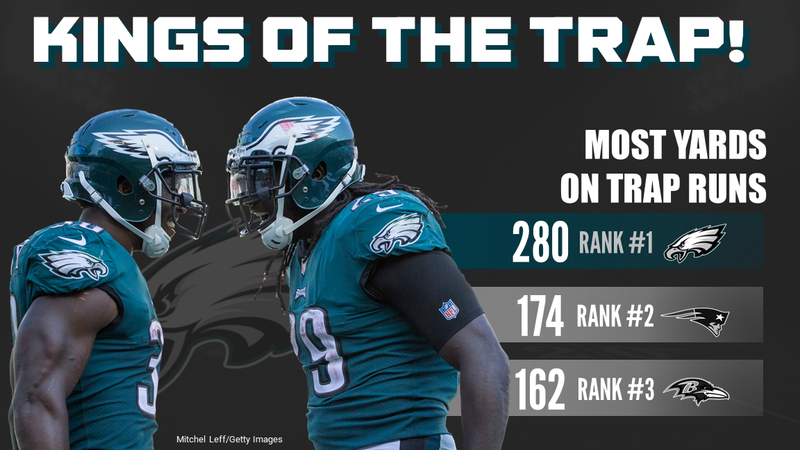 When it comes to executing trap plays this season, there’s the Eagles, then there’s everybody else. They’ve run 43 traps this season (seven more than next closest team) for 280 yards (94 more than any other team), gaining 199 yards after contact (109 more than any other team). That’s more than two a game for 6.5 yards a pop. Let’s take a look at what exactly makes this play so special for Philly. Notice how the left defensive tackle, David Irving, anticipates contact from the right tackle. When that doesn’t come, he gets off balance and doesn’t even need to be blocked. Because the run hits so quickly, the blocking scheme doesn’t even call for left defensive end DeMarcus Lawrence to be blocked, as he’ll have little time to react all the way back to the running back. With only a nice block from center Jason Kelce and a fairly easy seal from right tackle Lane Johnson, the Eagles spring a big run. This is the core principal of the Eagles’ rushing offense at work. The best-schemed running games don’t need five linemen executing to perfection to be effective; they thrive off regularly putting offensive linemen into favorable situations. The reason that Philly can continually run traps yet still keep the defensive off-balance is because they’re simply not going back to the same well. They have a myriad of different ways they can draw it up. The trap below against the Chicago Bears is undoubtedly my favorite variation. They leave both the 3-technique and 1-technique defensive tackles unblocked for the tight end and right guard to pick up. As a defensive coordinator, you can show this on film 1,000 times, but until you step onto the field and witness the mess of bodies crisscrossing in front of you, there’s no telling how your linebackers are going to react. 47 (Isaiah Irving), 52 (Christian Jones) and 44 (Nick Kwiatkoski) are all sitting ducks. Neither of the three steps forward at any point during the play, once again giving the offensive linemen the upper hand. From a personnel standpoint, it’s a play the Eagles are uniquely capable of executing. LeGarrette Blount and Jay Ajayi are both physically imposing backs that are unfazed by arm tackles when they have a head of steam. 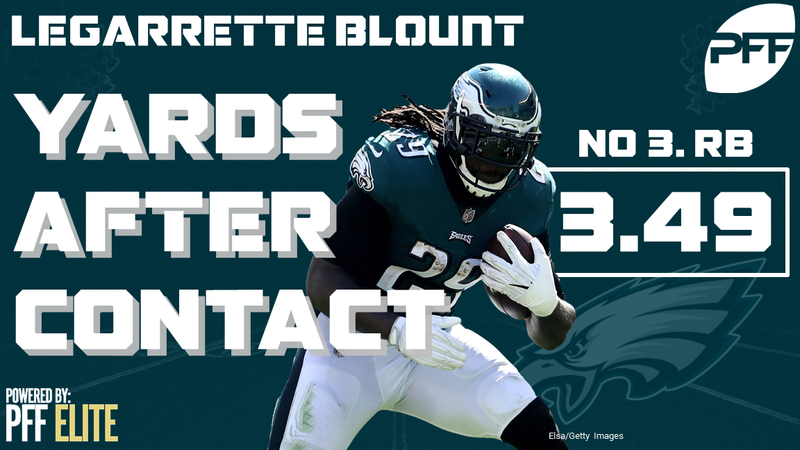 On the season, Blount ranked third among all running backs, gaining an average of 3.49 yards after contact per attempt. 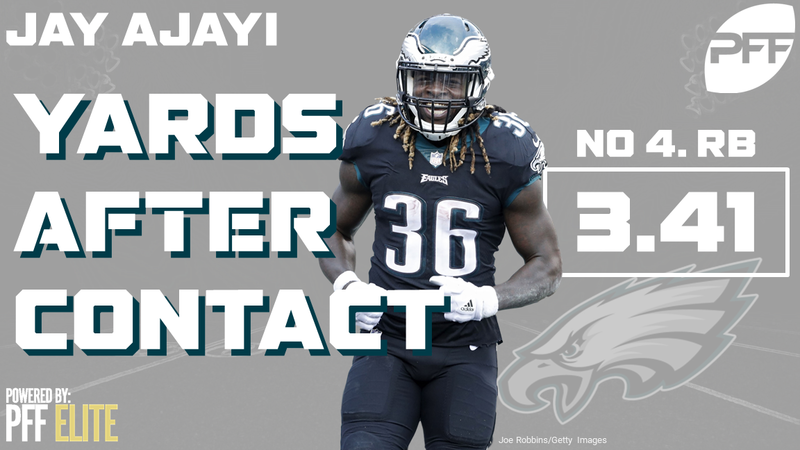 Ajayi ranked fourth just behind Blount at 3.41 yards after contact per attempt. Traps allow Blount and Ajayi to get that head of steam, as their job is to sprint through the defined point of attack. It’s part of the reason why they’re both in the top-5 for yards after contact per attempt this season. There’s no doubt that the Minnesota Vikings know Philadelphia will dial up at least a couple more traps on Sunday, but the big question is, will they be quick to recognize it when it happens?